Growing: Â Jamaica strain is a mostly sativa type of marijuana that can thrive well in any pot garden location- indoors or outdoors. 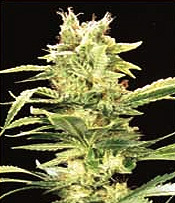 It grows in a medium height inside but when cultivated outside, Jamaica cannabis plants are taller. Leaves of Jamaica are light green in color because of low chlorophyll content. This is a robust kind of marijuana that can go well outside even when temperature and weather condition are in varying levels. Although pure sativas are expected to take more time to mature than indicas, Jamaica weed strain will not let pot growers wait too long for harvest. The flowering time of Jamaica will start in 8 weeks and finishes in 10 weeks. The yield obtained is average but the buds are guaranteed with potency. When smoked, an excellent sativa high without the psychedelic effect is experienced. The THC level is high and anyone who will smoke it should be ready for an excellent soaring high! I guess the effect produced in smoking Jamaica buds will vary from one person to another. According to some reviews, this strain doesnâ€™t create a trippy feeling. I do not feel the same way. I have tried smoking this marijuana type and Oh God, itâ€™s driving me insane!